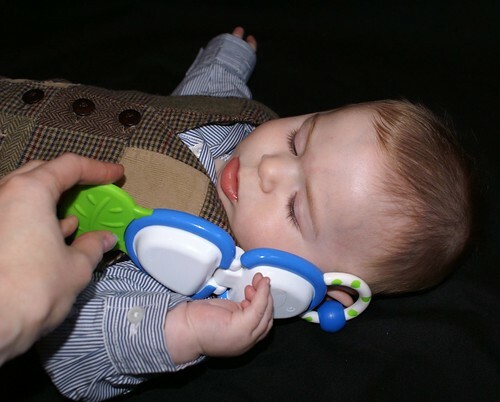 A couple months ago, Bubbers received a sweet gift from Charming’s Dad–a toy cell phone. On the phone was a post-it note addressed to Bubbers that said, “Give me a call!! Love You, Grandpa”. 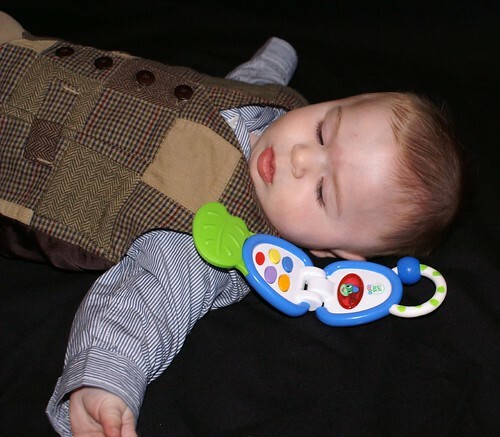 After a photo shoot with the phone (naturally), it was lovingly attached to the little man’s walker. The Bubbers man loved to chew on it and accidentally push the buttons. Pretty soon the buttons stopped working. Then it randomly called out, “Hola! Me llamo Tad!” in the middle of the night. Suddenly the buttons started working again, but it still rang and announced, “Hola! Me llamo Tad!” over and over again in sudden, startling spurts. I figured it was good company–made me feel like another adult was around, even if that adult spoke a foreign language. “RING RING!! HOLA! ME LLAMO TAD! !” cut through the silence of our home. “WaaaaaAAAAAAHHHHH!” the poor Bubbers began to wail in anger. The dear cell phone now has a new home far, far away in the bottom drawer of the armoire in the play room. oh I hate stuff like that! I avoided getting Elora noisy toys for a very long time… the worst now is when I’m trying to get Joshua to sleep and she brings out her xylophone. i agree with tearese, i hate the toys that make loud noises. isabelle has a few of those that people bought for her b-day. i finally had to hide them from her but she always seems to find a way to get them anyways!